Passwidget is a browser add-on which floods computer users with multiple third-party advertisements, which you should ignore if you want to prevent computer infections. Passwidget, also spelt PassWidget, is categorized as adware and can be removed from your browsers by powerful spyware and malware removal programs. 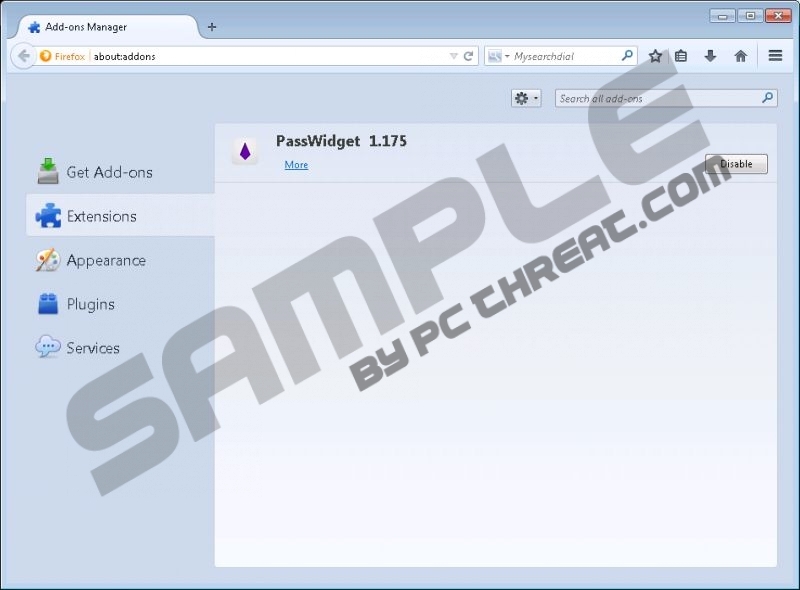 Passwidget is compatible with Internet Explorer, Google Chrome, and Mozilla Firefox. If you do not remember installing Passwidget by yourself, the odds are that it has accessed your computer along with other free programs. Passwidget is bundled with browser extensions, media players, format converters, and other software; hence, it is highly advisable to pay close attention to the information displayed on the screen. If you want to prevent unwanted programs, read the information provided and uncheck boxes concerning the changes within your browsers. Once installed, Passwidget starts monitoring your online behavior. The adware program records your clicks impressions, search terms, browsing history, browser settings, and other non-personally identifiable information. Third-parties may also use some tracking techniques to collect information about your browsing habits. Information about you is being collected for various purposes. It could be used to enhance the quality of the service and designed new contextualized ads. Moreover, the data collected may be shared with other companies. It is important to note that Passwidget does not own all those pop-ups displayed on your screen. Passwidget does not endorse third-parties and is not liable for their activities. You click on web banners, coupons, in-line ads, and pop-up ads at your own risk, which is why we strongly recommend that you ignore Passwidget ads. Some cyber schemers may employ Passwidget to promote their deceptive websites distributing fake updates and freeware. Due to the fact that Passwidget does not accept responsibility for the privacy policies of third-parties, you should be very careful when interacting with the different advertisements displayed by Passwidget. If you have no intention of using the offers displayed by Passwidget and you want to rid the browsers of web banners and other ads, take action to remove Passwidget from the computer. We recommend using SpyHunter because his real-time security program can remove the adware program and safeguard the system against Trojan horses, ransomware, rogue anti-virus programs, browser hijackers, and many other Internet-based threats. In case you are determined to remove Passwidget by yourself, use the below-given removal instructions and feel free to leave a comment below if you have any question concerning the removal of the adware program. Having removed the adware program, you should implement a reputable scanner. It is worth scanning the computer because some files associated with the adware program may be present on the computer, not to mention other unreliable files. Quick & tested solution for Passwidget removal.